Scholarships – Since 2009, YVSICT has awarded $26000 in college scholarships to Routt County students. Chuck Lewis Project – The Chuck Lewis Project involved over one million dollars of river improvements over a period of 10 years fo fundraising and river work on the stretch of the Yampa River through the Chuck Lewis State Wildlife Area, just south of Steamboat Springs. Also see the Ken Proper article about the revival of the Yampa River. 2014 Golf Trout Tournament raises $45000 for new Pleasant Vally Project and other Yampa Valley river projects. YVSICT has invested over $20000 towards the Pleasant Valley Project in 2014. 2013 REceived $158000 in matching Fishing is Fun grant from the State of Colorado for completion of PHase III of Chuck Lewis. 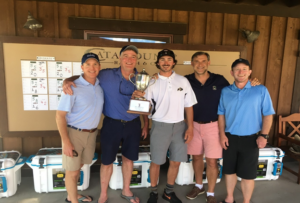 Golf Trout Trournament raises $55500 for completion of Chuck Lewis and new Pleasant Valley Project. Trousils/Humble Ranch donation of $21000. 2012 Golf Trout Tournament raises $32500 for the Chuck Lewis Project. 2011 Yampa Valley Fly Fishers joins Trout Unlimited as chapter 929. Golf Trout Tournament raises $30500 for the Chuck Lewis Project. 2010 Golf Trout Tournament raises $37750 for the Chuck Lewis Project. 2009 Golf Trout Tournament raises $36450 for the Chuck Lewis Project. 2008 Golf Trout Tournament raises $60000 for the Chuck Lewis Project. 2007 Golf Trout Tournament raises $48000 for the Chuck Lewis Project. Phase I of Chuck Lewis completed. 2006-2007 Wayne Swanson, the Swanson family and friends donated approximately $25000 to the YVSICT. 2006 Golf Trout Tournament raises $38000 for the Chuck Lewis Project. 2005 Golf Trout Tournament raises $28000 for the Chuck Lewis Project. Fishing is Fun grant of $150000 to the City of Steamboat Springs for Chuck Lewis Phase I.
YVFF volunteersinstall 40 new "catch and release" signs and posts provided by CDOW along the Yampa River from Walton Creek to the James Brown Bridge. 2004 Golf Trout Tournament raises $23000 for the Chuck Lewis Project. CDOW and YVSICT draft Memorandum of Understanding for the Chuck Lewis Project. 2003 Golf Trout Tournament raises $18000 for the Chuck Lewis Project. YVSICT comissions hydrology study for the Chuck Lewis Project. YVFF receives $2500 River Beautification Grant fro riparian planting project completed that summer. YVFF donates trout stocking at Fetcher Pond. 2002 Golf Trout Tournament raises $12000 for the Chuck Lewis Project. The YVFF commits to partnering the Chuck Lewis Project with the Colorado Department of Wildlife. 2000 YVFF donates $6000 to the Yampa River Management Plan. YVFF raises more than $7000 for stocking and facility enhancement at Fetcher Pond and Casey's Pond of the next two years. The CDOW was forced to eliminate stocking at both locations due to the impact of Whirling Disease on state hatcheries. 1999 YVFF donates $5000 to purchase 3000 Tasmanian Rainbow and Soda Lake brown trout for stocking the downtown section fo the Yampa River. 1998 After a two year campaign by YVFF, the Colorado Division of Wildlife grants "Catch and RElease" status to the Yampa River between Walton Creek and the James Brown Bridge. With grants totaling $29000 for the Steamboat Ski and Resort Corporation, Norwest Bank, the Yampa Valley Community Foundatino, the YVSICT and the YVFF, eagle scout Nathan Proper completes the Butcherknife Restoration project. 1997 YVFF completes the "Phase Eight" project on 1/2 mile of river behind the Super 8 motel. A solar irrigated tree nursary is part of the $25000 project made possible by private donations and grants from the Steamboat Ski & Resort Corporation, the CDOW, "Fishing is Fun", kthe U.S. Forest Service and the YVSICT. The YVFF receives a $7000 grant for the Steamboat Donations Committee to co-fund "Projecxt Transplant". Along with a $3000 donation for the Fly Fishers, a Vermeer tree spade was purchased for use by city crews on revegitation projects around town. 1996 The YVFF receives a $8234 grant from the Steamboat Donations Committee for further trout habitat improvement on the Yampa River in downtown Steamboat Springs. YVFF contributes $9650 in cash and in-kind services and receives co-funding of $323877 for the CDOW "Fishing is Fun" program. Total project value $41762. 1994 YVFF Yampa River Trafalgar Project receives the 1994 Steamboat Springs Chamber Beautification Award. YVFF receives $7260 grant from the Steamboat Donations Committee for low water trout habitat improvements in downtown Steamboat Springs. 1993 YVFF receives the Environment 2000 Shining Star award. YVFF receives $14700 grant for the "Trafalgar Project" in downtown Steamboat Springs. 1992 YVFF, Steamboat Donations Committee, CDOW, City of Steamboat Springs and the Nature Conservancy co-op funds and material to stabilize some 1500 feet of badly eroded riverbank. Over 5 days YVFF members and local volunteers donate over 800 hours to complete the project on city land purchase with Wallop Breaux funding fromthe CDOW "Fishing is Fun" program. Locations: Rotary Park - now the primary launching point for commercial tubing companies. 1991 YVFF receives $8565 grant from the Steamboat Ski &* Resort Corporation to plant native trees and shrubs, install flood control structure and low water trout habitat improvements in 1/4 mile of the Yampa River in downtown Steamboat Springs. 1990 YVFF are awarded "Sportsment of the Year" by the Colorado Division of Wildlife and Colorado Wildlife Commission for their volunteer efforts in habitat restoration of King Solomon Creek, Service Creek, Pearl Lake, The MIddle Fork of the Elk and the Yampa River. The U.S. Forect SErvice follows with two like awards. CDOW electro shocking studies produce 165 trout where just 17 were recorded in 1985. The Division imposes a 2 fish limit to protect the resource, the first special limit regulation in the area. 1988 YVFF receives a co-funding grant from the CDOW's "Fishing is Fun" program for the volunteer restoration of spillway and bank erosion problems on Service Creek. 1987 YVFF receives a grant from the Chamber Summer Marketing Committee in cooperation with the CDOW, the U.S. Forest Service and local anglerspublishes the first brochure of its kind in Steamboat Springs, "Making the Most of Your Fishing Vacation in Steamboat". 1986 YVFF receives a grant from the Steamboat Springs Summer Marketing Committee for stocking fish and construction educational signage above the Yampa Habitat Improvement Project. 1985 YVFF receives a grant from the Steamboat Ski Corporation to improve trout habitat through the town of Steamboat Springs. The YVFF and Friends of the Yampa completee a habitat improvement project in what is now Rich Weiss Park and down to the 5th street bridge. Colorado Division of Wildlife electro shocking study produces just 17 trout.